Share the Love: You are the Pom - C.R.A.F.T. Note: The Share the Love series is in full swing! Every Tuesday and Friday until heart day we, we’ll have a free valentines day ideas for you on C.R.A.F.T. Love Nutella? Check out last weeks freebie! Oh and if you need more ideas, here is a list of 150+ clever Valentines Day sayings paired with small treats! I am so, so excited to be here on C.R.A.F.T. today! I just adore Jamie and her cute blog and feel honored to be here with you, her readers. My name is Lindi Haws and I blog over at Love The Day. I love throwing parties, crafting, designing and I really, really love Valentine’s Day. I love the excuse to speak in puns, give cheesy cards and smother loved-ones and spouses with homemade gifts. I have a whole slew of cheesy printable valentines over on my blog but am excited to share one of my newbies with you today. This would be a great gift for kids, teacher or any craft lover. Here’s how you recreate the idea… Just download the free ‘You Are the Pom” printable, save to your desktop, print and then cut out with a 2.5’ circle punch. 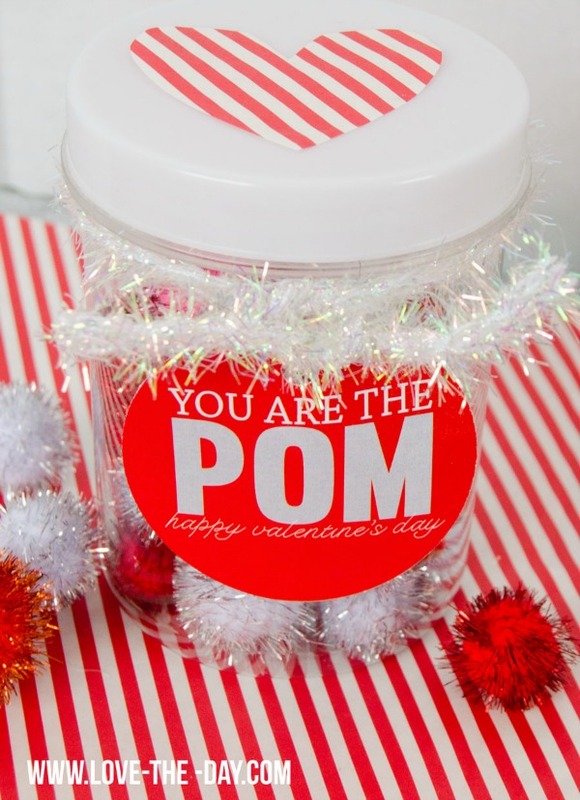 Next, tie your printable to a jar, bag or box full of pom poms and gift away. It’s easy, cheap and a great surprise for the loved ones in your life! 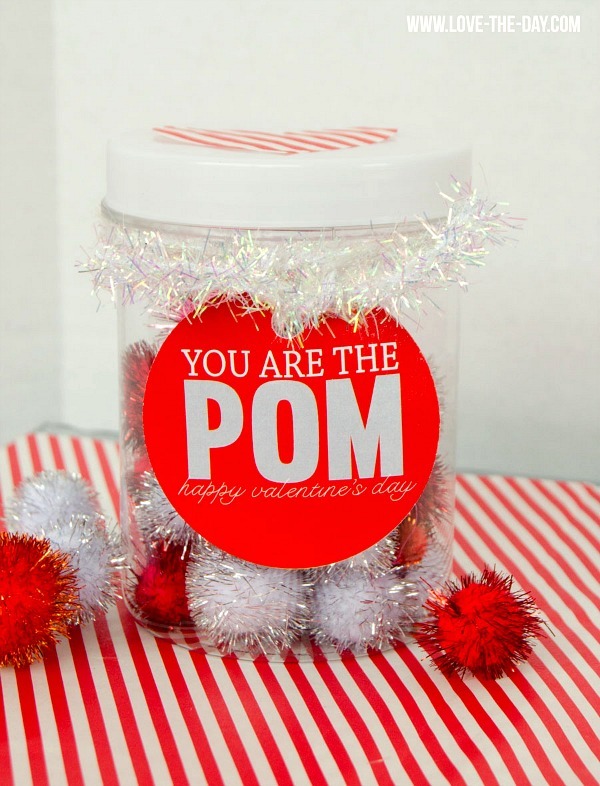 To download the “You are the pom” free printable Valentine, just enter your name and email address below and the free file will be delivered to your inbox! The pom pom Valentines come 12 to a page. Thanks again, Jamie, for having me and make sure to visit me over at Love The Day. Too cute! My daughter loves to craft, so this is something I’m going to do as a surprise for her during the witching hour. Thanks for the printable, Lindi! Yay! I’m happy to hear that you have the perfect person to give this Valentine too!